After the success of Aakash 2 cheapest tablet in India, the Professors at IIT madras are planning to make a more advanced version of Aakash Tablet with which the students will be able to enjoy all such features as in other tablets. Aakash 3 is being developed by Prof. Ashok Jhunjhunwala, professor of electrical engineering at IIT Madras. Prof. Jhunjhunwala says that the Aakash 3 (A-3) will be ‘remarkably different’ from the previous versions of Aakash. Aakash will aim at bringing a revolution in Indian education system and that’s why Aakash – 2 won’t be sold in markets. Instead, the devices will be distributed among 20,000 engineering students across India so that they can build India specific applications for the tablet. Deepak Parekh, Head of IIT Bombay’s Kanwal Rekhi School of Information Technology is piloting a project with 20k engineering students and over 11k professors & lecturers. As the students at different foreign universities are already using the tablets for doing there homeworks at colleges, we will soon be able to do such kind of stuffs in India too. 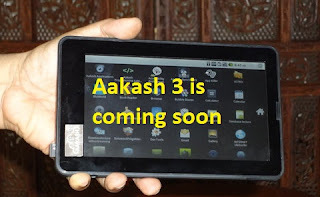 We don’t have information on the hardware and software specifications of Aakash 3 yet. But the tablet is expected to make an entry in the markets in the ‘next few months’ as the ecosystem it requires gets ready. Can Aakash help in reviving the Indian education system? If yes How?? All the readers are requested to share there point of view on the above question.